Arriving from the north, having seen extensive works in progress on the new Forth crossing from the present road bridge, I took advantage of the Park and Ride (P+R) site at Ingliston, one of five strategically placed sites close to the city’s ring road. The site is well used and has the benefit of a centrally placed waiting room with manned enquiry office. The office sells tickets which is great for visitors not used to the no change policy on Lothian Buses, it also has a good selection of timetables and route maps. £3.50 buys a day ticket and it’s time to board a citybound bus. At peak times the X12 follows the A8 straight into the city, adding to the all day service on the 12 and 35, both of which leave the A8 to serve worthwhile traffic objectives, an out of town shopping centre and business park. I choose the 12, a Lothian Buses Gemini, clean inside and out even after the morning peak and get a good view of the completed tram line, most 12s are single deck. The tram will serve the Park and Ride although its stop is off one corner of the large site, in this aspect it mirrors several intermediate traffic objectives, it serves them but away from their core where the buses go. 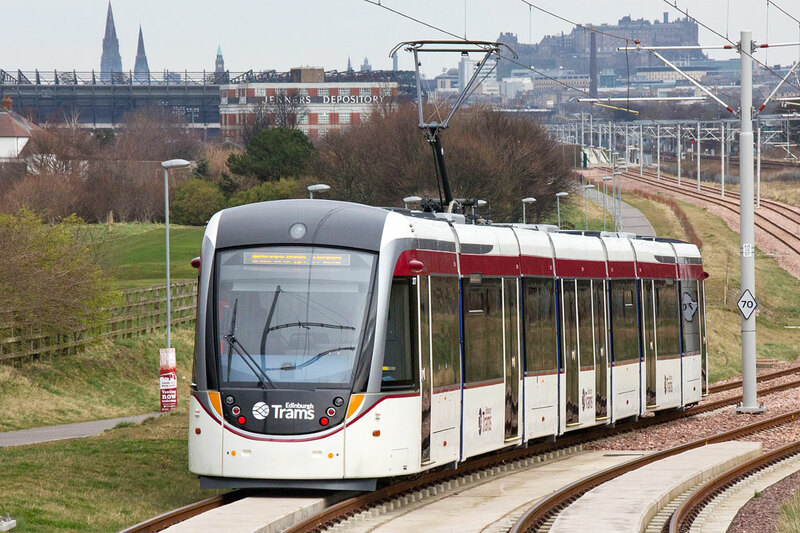 With limited stops and a route mainly segregated from traffic, the tram will no doubt prove popular with P+R users looking for a faster journey into the city or to the stadium at Murrayfield. The 12 returns to the A8 at Corstorphine, a suburban village presenting a significant traffic bottleneck. Once through, the road widens and green painted bus lanes are provided in both directions but the road is in poor condition and the Gemini’s suspension takes a hammering, has the road renewal funding been diverted to the tram project overspend? On the return journey, the X12 avoided the bus lane except at the most congested points making for a smoother journey. Alighting at Murrayfield, there was the chance to observe the tram in action as over a thousand volunteers were taking part in tests to see how the tram would cope with crowds exiting the stadium to, in this instance, a tram stop closer than the local buses. The local press said the tests went well but had to find a negative aspect, featuring a couple who complained that even the tests were late in starting! Resuming my journey into the city centre after following the foot and cyclepath built alongside the tramway, I sampled one of Lothian Buses Volvo 7900H hybrids on route 1. They are bright and airy inside with plenty of low floor space although the seating layout at the rear appears to have been dictated by the necessity for a rear door in some European applications. The lighter coloured trim for priority seats is a positive touch and there are posters explaining very basically how the hybrid system works. In practice, crawling through the many sets of traffic lights in the older part of the city, there were times when pure electric operation at low speed demonstrated just how smooth and quiet they could be but the noise and vibration rose considerably once the diesel engine cut in. A positive case for the ‘plug-in’ version under test in Gothenburg! 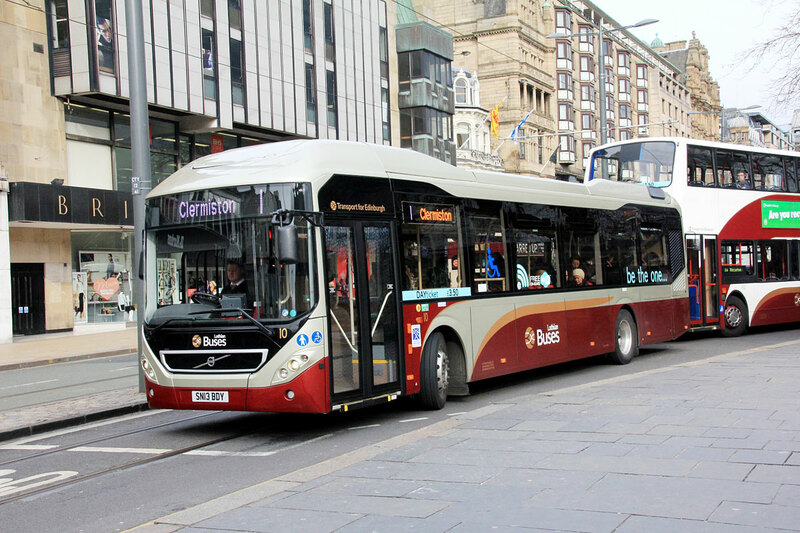 Once in the city centre, the importance of the bus to Edinburgh’s life is unquestionable. With Princes Street reopened to them end to end, there is a constant stream of buses using this main thoroughfare, smaller presences from Stagecoach and First mingling with the Lothian Buses, the majority of which now carry traditional madder and white colours, these are also being applied to the trams as they are commissioned, giving a consistent appearance under the Transport for Edinburgh banner. The tram is due to open in May and faces an early test with a One Direction concert at Murrayfield. By my next visit it should have settled into routine operation and give the opportunity for a visitors review of its impact.